Cambridge is an Elegant Layered Jacquard Valance, 56"W X 17"L, Valance has 3" pocket and 1 1/2" header. Cotton/Poly blend, machine washable. Top layer of floral scroll pattern fabric, bottom layer of solid coordinating fabric. We love our valances! They look wonderful and are just the right touch to finishing our remodel. I would like to point out that the description says these are burgundy, but they are really more rust colored overall. The color on my computer showed rust and they were definitely the same as the picture, just not the description. That's why 4 stars and not 5. Very fast shipping. We received them within a week of our order. We ordered 14 and received them all. I like the live update on the number available. Overall, great price and product! ConsThese are not burgundy; they are rust. I really like these valances. I bought curtains from somewhere else and was praying these valances would match and they were a perfect match. They are good quality and they hang nicely. They arrived just as they said they would. I think I would of loved them if they were cotton, not a big fan of the stretchy material. The curtains that arrived were EXACTLY as seen on the computer screen. They match my existing patio curtains perfectly. It's not often that I Google an item and am shown to a site that not only matches what I Googled, but exceeds the quality and value I expected. Thank you Swags Galore! I wouldl most definitely recommend your site to anyone. I would order again from this company. These were very nice but they were not Burgandy so I had to order some different valances from you in crimson and they worked great. ProsGreat valances but were not burgandy. ConsBeautiful valances just wrong color. Everything that I was looking for that I couldn't find in a store! Beautiful and reasonably priced!! I purchased 1 because I didn't want it full and fluffy, rather flat and tailored. Very nice valance that was true to the description and colors as posted. Just needed a touchup iron to get some wrinkles out. Order processing and shipping was fast and faultless. I will be ordering more of this same pattern in a different color for other rooms in the future. It was time to replace curtains in two bedrooms. I am completely re-doing the whole house. I saw these curtains and thought they would be just right. I ironed them and put them up and it added just the right amount of charm to my new rooms. I like them very much. Proscolor and fabric are good quality. Price was very reasonable. These curtains look lovely in my dining room. It took more panels than I anticipated to get the effect but they look just like they were presented. Lovely! The product is exactly s described and pricing was inviting. looks very nice on my windows, happy with this purchase! I bought these valances for a new log home cottage. The layered look was my first priority. Turned out to be a fabric that matched some of the fabric in the quilt I purchased, so it came together beautifully. Lovely valance-exactly color I was looking for. ProsQuality valances-looks nicer in person than on website. ConsHave to iron the seam on both layers of curtain so they don't show. I had been looking for something to fit a wide rod for awhile now. I was so happy when I came upon your website. The swags are attractive and of a better material than I had seen in many of the department stores. Very pleasing experience.Item arrived when I was told that they would and they look very nice. These look great!.. used them in my kitchen. I needed to use two for 36" wide window for it to look like advertised picture. After receiving the wrong item, Jim took care of it sending out the right item and a return shipping label right away...when my items arrived I liked them immediately . Yeah, u got to iron them,but u do for any valance packed in a bag. It was a good experience. These valances were exactly the right color for my kitchen. Very good value. Quality is high enough for something that is a foot above everybody's head. As other reviewers mentioned, I did have to iron these but it's a one-time deal until I wash them a year or two from now. Overall I am very pleased and will look here first next time I need window hangings. They are not really sheer, but you'll need 3x your window for sure. Fabric is beautiful. Bought enough panels to do 2 large windows in our family room & they look as good as I imagined. Required lots of ironing but well worth the task. Swags Galore has a great selection & great prices I couldn't find anywhere else. ProsShipping was speedy- loved that! Loved the item for your sale price. Lots of choices on your website. ProsGreat look on this topper curtain for the sale price. I was very happy. ConsSorry it did not come in white; would have preferred white but the beige color (taupe) was fine. The price we pay for these curtains along with the quality allows no reason to shop anywhere else. From the time I hit the place order button I had my package three days later. I'm very satisfied and will continue my curtain needs with Swags Galore!!!!! Easy to order, high quality curtains. Exactly what I ordered. I agree with other reviewers about the poorly done hemlines. I had to use a lot of steam and hot iron to get the hemline flat and looking ok on both layers. I'm not a sewer, so I wouldn't know what else to do to make it look good. I used them in my bedroom on 2 windows with wooden blinds and I think they look great now that they are up and more importantly, my husband approved. A little disappointed with the quality of the work--specifically in the hem of the top layer. I sew myself, and know I would have done a better job with that. But the styling is great and fit right into my room (bedroom). In fact, it looks like it is part of a set (matches my comforter very well). ProsColors good. True to the description. These were wonderful! The picture and description was right on! ConsCould have been a bit better sewing on the hem area. Great quality and you can't beat the price! Shipped very quickly. The color is exactly as described, and exactly what we hoped it would be. The layering and scallops are a nice touch. As other reviews noted, the hemline is quite "shabby", and I needed to iron them to try and get some semblance of a fine line. While The ironing didn't totally work, it is better. Definitely buy again regardless... Amazing how quickly items are shipped. Love that! ConsHemline on both layers should be better sewn; needed to iron them to get it somewhat better. Very classy looking on window. Color is nice rich deep olive. Hem line could be finished nicer. Be careful washing as hem line could unravel. The shipment of 12 valences came quickly- they were just the shade of blue I wanted. The only comment I have is that I had to press all the hems so they wouldn't curl and show the hem underneath- maybe a little larger hem would have been better. However, they look great on the windows and I have had many compliments. 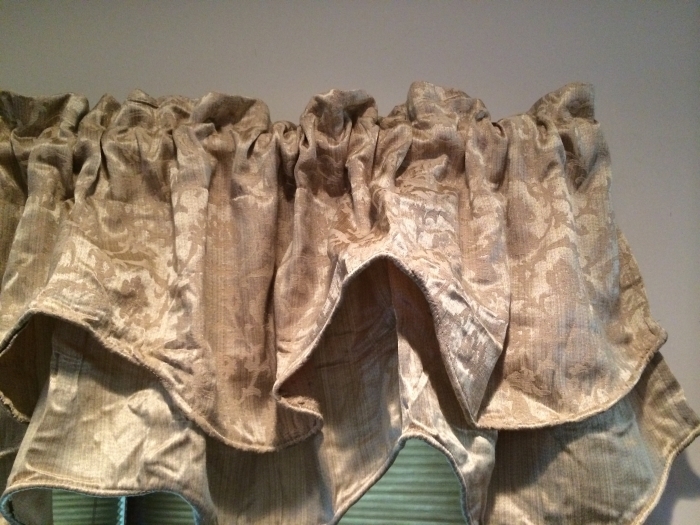 Looked for this type of curtain /valance everywhere. Found this on line and love it! I haven't hung them up yet, but they appear to be very nice. Very pretty and made with quality material. The only problem is the stitching underneath is ragged but al in all this is a beautiful swag. I love my new valances. They look great in my kitchen. Delivery was very fast. I am enjoying my double layered Swags. Great color and price. Looks as good at home as they do in the picture. Easy ordering, reasonably priced, and good quality material. I received my order as was indicated. ConsThe underside hem shows when hung, but from what I've seen in stores, they're all like this. Took awhile to enter my feed back as we ordered these valances in advance as we are redecorating our living room and wanted these on hand when ready. We finally got to hang them on 06.28.13 and they are perfect. The only thing with them is the hem material on the back side could of been trimmed up some in places but over all received quickly and in great conditions. Of course the price was a large point and wasn't sure about ordering online. After recieving, I was amazed at the quality. The pictures don't do them justice. The items were packaged very nice, emails kept me informed, and shipping was on time. Great product, great price, great company, will definitely recommend to others. These are high quality, upholstery type fabric valances. They are absolutely beautiful and worth far more than what we paid!l You cannot go wrong with these. Seems to be well made and very nice quality. I will be purchasing several more pair of curtains very soon. Highly recommend them. This was ordered for my office but instead hung it in guest bedroom. It was perfect match (color) for bedding!